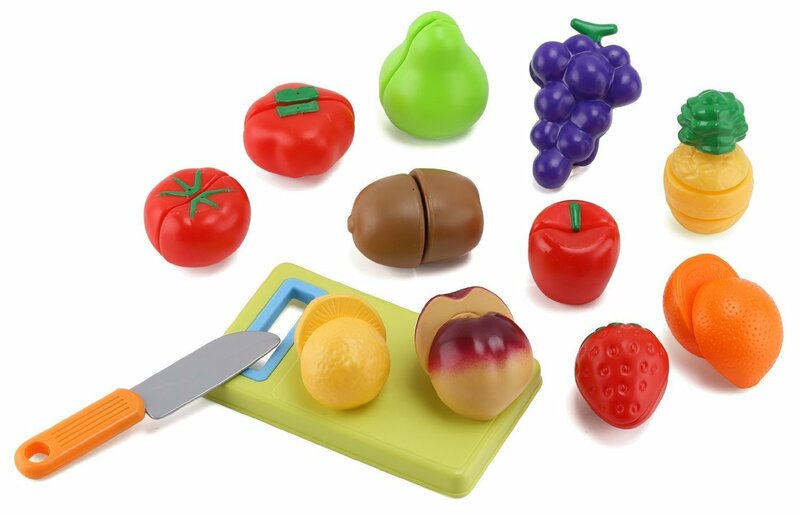 I just got this great set of pretend fruits from Click N’ Play Homeco. This is a really fun way to spark some imaginative play in your little ones. This is a set of pretend food, this set is fruits. You get 10 different veggies (grapes, apples, orange, and more). The fun thing about these is that they are in two halves and held together by velcro so they can use the included cutting board and knife to pretend to cut the fruit in half. They are made of durable plastic and hold us really well. I got this for my six year old, she loves to play pretend. She has a little play kitchen and grocery store. So I got this set for her to use with her playsets. She spends hours playing with her kitchen pretending to cook, the cutting addition to these fruits really helps to spur the imagination. She loves them!